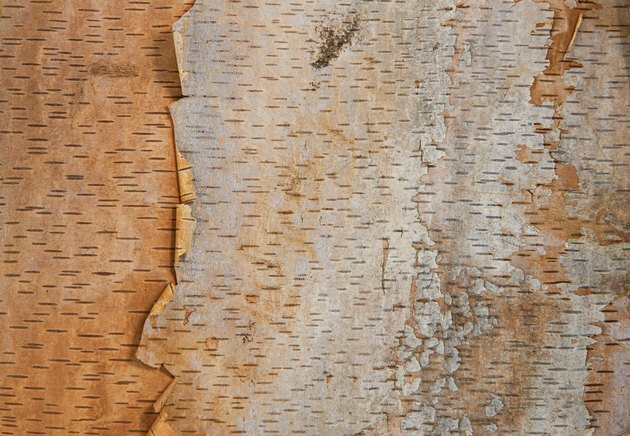 A fast-growing shade tree, river birch (Betula nigra) is the most widely adapted of the birch trees. It is hardy in U.S. Department of Agriculture plant hardiness zones 4 through 9a. In USDA zones 8b and 9a, river birch needs regular irrigation to survive the heat. River birches have distinctive exfoliating bark. Since river birches can reach 40 to 50 feet tall and 20 to 30 feet wide, they need plenty of room to grow. Space them 15 to 20 feet apart and at least that far from hardscape elements. Avoid planting them in shallow soil in USDA zones 8b and 9a, so they can establish deep root systems to survive the heat. River birch grows best in full sun, but tolerates partial shade. The tree will grow in a more open shape if planted in the shade. The drooping branches can be messy, so don't plant them close to high-traffic areas unless you want to clean up after the trees and prune them regularly. As the name implies, river birches prefer moist soil. Once established, however, they will tolerate dry soils. They grow best in acidic soils, and develop iron deficiency in soils with a pH higher than 6.5. This high sensitivity to alkaline soils means you should test your soil before planting river birch to make sure the soil is safe. Adding organic matter to the soil before planting will improve the texture and increase the soil's ability to retain water. Composts are a familiar amendment, but they are often slightly alkaline. Unless your soil is already acidic, don't use compost when amending soil for river birch. Sphagnum peat moss is a much better choice than compost, since it has an acidic pH. Spread the peat moss 4 inches thick over the soil surface where you will be planting. Mix it into the soil to a depth of 8 to 12 inches. If possible, amend and till the soil in an area two to three times the size of the hole you'll be digging to plant the birch tree. If a soil test indicates the pH is too high for river birch, applying granular sulfur is an alternative to amending with peat moss. If the current pH is 8.0, apply 0.3 to 0.4 pounds of granular sulfur per 10 square feet. For soil with a pH of 7.0, apply 0.1 to 0.2 pounds. If you're applying more than 0.2 pounds per 10 square feet, spread this out over two applications three months apart. This is best done a year before planting the tree. Plant in the late winter or early spring, just before new growth starts and after soil temperatures are higher than 45 degrees Fahrenheit. Dig a hole 2 to 3 times the size of the container or root ball. Make the hole the same depth as the roots, so after planting the tree sits in the soil at the same depth that it was growing previously. If the plant is balled and burlaped, set the whole root ball in the hole without removing the burlap. Fill in about three-quarters of the hole. Loosen burlap and fold it back so the top of the root ball is exposed. Remove any wire that was holding the top of the burlap. Finish filling the hole. For container-grown plants, remove the tree from the pot. Use a pruning knife or shears to cut any large roots that completely circle the root ball, and loosen the smaller roots by hand. Set the plant in the hole and fill in around the root ball. If the container is biodegradable, tear off any part of the pot that extends above the soil level and cut five or six slashes in the side of the pot with a utility knife, then plant the entire thing. Before use, disinfect any cutting tools by soaking them in a mixture of 1 part bleach to 3 parts water for 5 minutes, then rising them with clean water. Watering enough to keep the root ball moist after planting is key. To help keep the water near the root ball, build a ring of soil 6 to 8 inches from the edge of the hole. Fill this ring every time you water. The ring should be smoothed into the soil by the end of the second growing season. For plants that were grown in containers, plan on watering two or three times a week for the first few weeks. Plants that were balled and burlaped typically have roots surrounded by a water-retentive soil and only need water once a week. Avoid over watering by checking the soil moisture before watering. If it still feels wet, don't water. About 1 inch of water per week is a good guide, perhaps more in particularly hot weather.